'Hello. I'm writing today because I've noted your criticisms of me in your blog-columns, during the past month of the Norwich North byelection campaign; now that I finally have some time to draw breath and potentially respond, it occurs to me that the most interesting and satisfactory way in which we could engage over these matters would be a debate, in person, in public. So: would you care to debate with me over the issues you have raised, presumably concentrating on questions around Iraq, Israel, terrorism etc, at some public venue e.g. in Norwich or in London, sometime in early Autumn? Sign up for lighter evenings! views misrepresented and my character viciously attacked in a number of areas. These depictions are both baseless and (in a number of cases) libelous. I abhor violence and I abhor racism and discrimination in all its forms. on Iraq was unprovoked and internationally-illegal. as Tony Benn and Charles Kennedy have also said). we in Britain take for granted. to criticise the foreign policy of the state of Israel without being smeared as 'anti-Semitic'. seemed to be a spontaneous political movement with little coordination. Zelay to the border or in the border area," says Wallgren. demoralize and demobilize the supporters of the legitimate government. Cortiña, the Argentinian leader of the mission. right to travel freely in their own country. 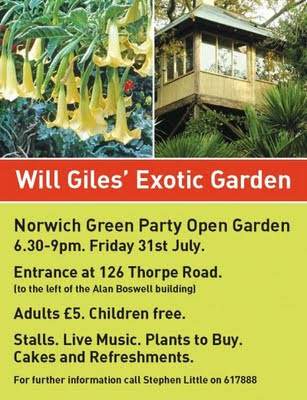 NORWICH GREEN PARTY 'GARDEN PARTY', FRI 31st JULY - OPEN TO ALL, PLEASE DO ATTEND! boost for ourselves and Ukip, and another bad day for the "big three"
compared to their result in 2005. Green party campaigners were today celebrating their performance in the Norwich North by-election after more than tripling their vote, compared with the 2005 general election. The result was by far the best performance ever for the Green Party in a Westminster by-election. The Green Party received 9.7% of the vote, up from 1,252 in 2005 to 3,350 today. In comparison to 2005, the votes of Conservative, Labour and LibDem parties all went down. The Labour and LibDem vote also fell as a proportion of the turnout. Adrian Ramsay, opposition leader on Norwich council, and the Green Party's deputy leader, said: "This was our best by-election result ever. Our best previous result was 7.4% in the Haltemprice and Howden/David Davis by-election. We started from a low base (2.7% in the 2005 general election), and we trebled our vote. On the ground, we had roughly £12,000 to spend, compared to the £100,000 that the Tories have apparently spent." "Rupert ran a positive campaign, on issues such as the NHS, renewable energy, transport and living wages, and we are very pleased with the level of interest we've generated. With new members and supporters, we can now concentrate on Norwich South for the general election." On the issue of the coming general election, Ramsay said that: "Norwich South will be different from Norwich North, since two-thirds of Norwich North was outside of Norwich City. The Greens have led local election vote share in Norwich for the last three years running, and we are the official opposition within Norwich City." 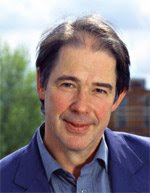 Rupert Read, the by-election candidate, added that: "The Norwich North campaign was done on a fraction of the budget of the large parties, some of which deluged residents with countless leaflets. We are pleased to have done so well without that kind of overkill." http://www.youtube.com/watch?v=DjmZBb_08GU - Question 3, Norfolk Unitary Authority. "Norwich people should not doubt their own power to change politics. They can. They already know that by voting Green they can get a Green politician - there are 20 Green councillors in Norwich. If they vote Green again (tomorrow/today), they will get a Green MP, make history and change the face of British politics. They will also give millions of British people hope, whereas one more Tory, LibDem or Labour MP would change nothing. "This campaign has been a great step forward for the Green Party. We originated a pledge to run a clean campaign, which most of the other main parties signed. We've been helped by many supporters both local and from far afield, with a 'battle bus' run on recycled vegetable oil, but with only a fraction of the financial backing of the other three main parties. Yet we are seriously challenging the old parties. I hope Norwich voters continue to 'do different', as we say around here. Britain needs that difference and electing the first Green MP would make a big, big, difference." 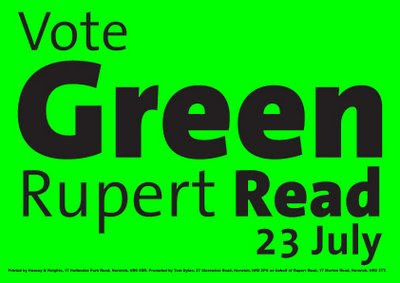 Rupert Read and the Green Team will continue campaigning throughout polling day, Thursday. Their 'chip fat' battle bus will be touring Norwich. "The Green party are developing, they know they've got a lot of support and the other parties better take notice because they work hard, they are young and they are keen. I've no doubt that Norwich could fall to them in the future." The Norwich North byelection offers a remarkable opportunity for the reshaping of British politics, less than a year out from the next General Election. For the first time ever, a Parliamentary byelection is taking place in a centre of Green Party strength, and the Greens' prospects are (as a result) being taken wholly seriously by voters and the media. Less than six months out from the Copenhagen climate conference, a conference that will make or break efforts to protect our climate from the battering to which human activities are subjecting it, it would be extremely timely to have an unprecedentedly strong showing from the Green Party in this byelection. Moreover, the Greens' strong commitment both to cleaning up politics and to achieving social justice only add force to the argument. And against the backdrop of an unprecedented and understandable loss of faith in the 'main 3' Parties, it is clear that there is all to play for in Norwich North. 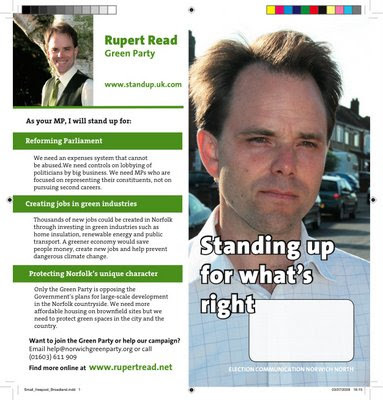 We the undersigned know the Green candidate, Rupert Read, and know him to be a person of integrity. We are pleased to be able to write in support of his candidature today. If the people of Norwich North vote for him, they will be voting for someone who would make a fine MP for a fine city. Mark Lynas, columnist and author. This billboard has gone up around Norwich North, for the final week of the campaign! 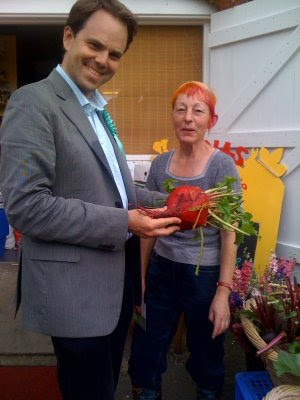 This is the proprietess of Anna's Farm shop (Anna) in Norwich North, giving me a prize organic beetroot, in return for which I gave her a Green posterboard! > for Norwich North: make the byelection there happen asap! > takes place within the next month! > Thanks for submitting your petition. The Big Green Bus Hits Norwich North! Thanks to everyone who has donated time or money to our campaign so far - the support has been fantastic and we've now raised nearly £2500, every penny of which is priceless as we Greens struggle to compete financially with the westminster party machines. We still need as much help as possible though, on the ground (and at the bank!) so if you think you can assist please get in touch using the details below or click the donate button on the left hand side of the blog! This piece on the rising 'voter rumble' in the Norwich North by-election, was in yesterday's SUNDAY TIMES, penned by Rod Liddle. Better still: that voter rumble, according to Mr. Liddle, is the Green Party coming up! This is some article... read it and pass it on!! The Green Party’s campaign bus takes to the streets of Norwich this week helping by-election candidate Rupert Read to deliver his message to every corner of the constituency. 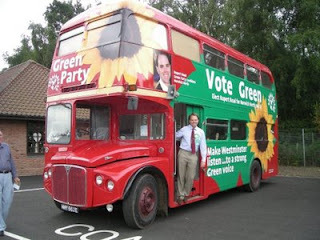 In Green Party livery, the classic Routemaster looks like a familiar London red bus but its actually green, running on recycled cooking oil. Monday July 20th: Rupert Read and his Green Team of volunteers are joined on the London bus by the chair of the London Assembly, Darren Johnson. Starting from the railway station soon after 10.30 they’ll make stops around the city centre including Castle Meadow, All Saints Green and Theatre Street, speaking to passers-by about Green Party policies for radical improvements to public transport, including re-regulation of the bus industry so that it meets social need. Green London Assembly members ensured that all new London buses will run on hybrid engines by 2012 creating a third less pollution. The Greens would like to repeat this success in Norwich. "There are no Green MPs yet in the House of Commons - and it shows! Greens have been a breath of fresh air on Norwich City Council and now we need that Green voice in Westminster. 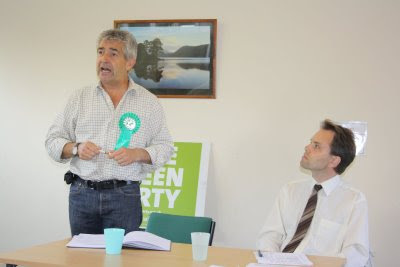 That is why I am urging people to vote Green on July 23rd." Later in the day the campaign bus will be touring the Thorpe area. 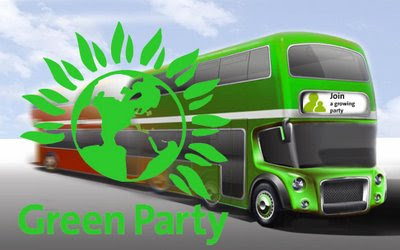 Tuesday July 21st: The Green Team welcomes aboard the London bus Sian Berry, Green Party candidate in the London mayoral election. The London Assembly recently introduced a “Living Wage” of £7.45p an hour – above the government’s official minimum wage. It’s now the minimum for public sector workers in London and businesses are encouraged to follow suit. Thanks to Green Party councillors, the “Living Wage” has been adopted in principle by Norwich City Council. Economists are currently assessing at what level the “Living Wage” should be set in Norwich. At 10.00 the campaign bus will drop Sian Berry outside City Hall where she will meet Green councillors to help them promote the scheme. “As a councillor in Norwich, Rupert Read has worked hard on local issues, from housing to fair pay, and has made a real difference to people's lives. As a philosopher, he is just as comfortable tackling the big issues, from the best way to deal with climate change to the need for peaceful ways to resolve conflicts. Later in the day, the bus will be touring the Catton area. * Make them listen - about accountability and Green proposals for reform of Parliament. *Protect the countryside - opposition to large scale development in Norfolk countryside. 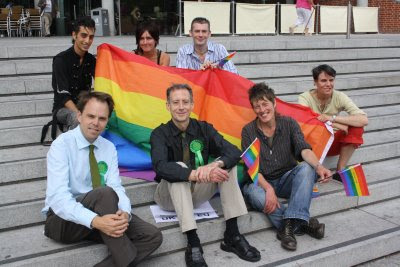 Rupert Read, Peter Tatchell and Norwich North activists with our campaign messages! we support a £165 a week state pension. especially empty stock, as well as some new Council-house build). more support for housing co-ops and greater protection for tenants. will lead to a better future for people in Norfolk?! ex-Labour voters, are switching to the Greens. risk that they will be sued for negligence." not the "brown economy of yesterday." more nearly 200 financial institutions around the world. by-election is taking place next week - is that of academy schools. in 2000, are state-funded privately run schools with outside sponsors. process and its first principal has since departed. letters saying Ms Knight would no longer be principal of the school. impact on the community of Heartsease". supporter of academies and will do everything to support it," he said. satisfactory, with only six rated outstanding. that academies should not be imposed from above. together to raise standards," he said. local concern about Heartsease and the departure of the principal. schools and run them the way they know is best for their children,"
schools to a reasonable standard." 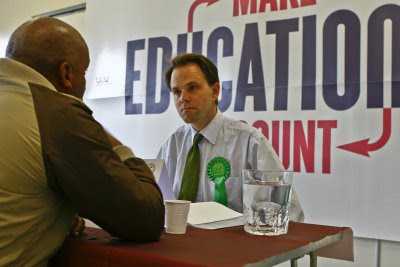 Green candidate Rupert Read criticised the need for academy schools. said academy schools were not the answer for improving education. like a grammar school in every town." motivated by peculiar religious views". 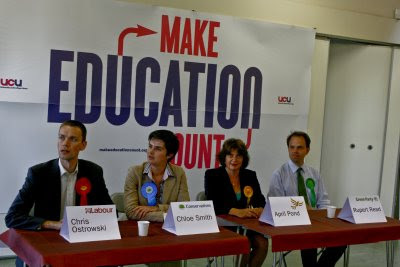 politicians should first "make sure children can read or write". evaded the real issue of the need for discipline in schools. The Norwich North by-election is taking place on Thursday 23 July. 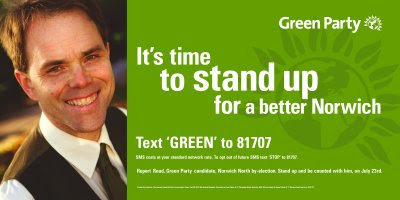 Councillor Rupert Read, Green Party candidate in the Norwich North byelection. Education for over sixteens in East Anglia is being damaged by the recession. That was the warning today from Rupert Read, the Green Party candidate in the Norwich North by-election, and a Norwich city councillor. Dr Read, who is a lecturer at the University of East Anglia, was responding to a report released today by the University and College Union (UCU), which reveals that in the Eastern region at least 39 jobs are at risk in further education and 28 jobs are at risk in higher education: a total of 67 jobs at risk. In total across the UK 5,891 jobs are at risk or being cut with 4,593 in higher education and 1,298 in further education. Over 100,000 students will be affected. The union warned that the figures understate the problem as many colleges and universities have not released their full staffing plans, but job cuts are growing. 'Across the UK there is a worrying cutback in the staffing of post-school education. East Anglia has not escaped this, with job losses growing across the region. It is clear that universities and colleges are tightening their belts, cutting back on staff and worsening the prospects for school leavers and others wanting to study.
' UEA (the University of East Anglia) has so far managed to avoid compulsory redundancies for teaching staff but unions are concerned by the lack of information available about staffing plans. In the Eastern region, 67 jobs are at risk: 39 in further education and 28 in higher education. Great article in the Guardian on the Greens and Norwich North. Perhaps someone should point out to the LibDems though that THEY are the ones dividing the non-tory voters...The Greens are the party with the momentum! "What we're finding on the doorstep is that people are really looking for a different voice, they're looking for a fresh input into politics. That's what our candidate Rupert Read can provide. That's what I think people are going to vote for on the 23rd." ...Caroline Lucas MEP, Green Party Leader. Norwich Green Party remains sceptical about the Rackheath eco-town which was given the go ahead by government today. Green councillors say the development is part of an oversized growth plan for Norwich and is certainly not yet 'eco' enough. The decision to go ahead, they argue, must now kickstart fresh thinking and consultation on how much development Norwich really needs, how it can be sustainable and how an eco-town can be part of it. The party also emphasises that the best eco principles should in any case be in all local housing and transport stategies. Green councillor Rupert Read, the party's candidate in the Norwich North parliamentary by-election, welcomed the government statement that the eco-town does NOT require the proposed Northern Distributor Road (NDR) - a view long held by Green Party councillors but rejected by other parties. He called for the NDR to be scrapped. The association of the NDR with the plans for the eco-town has been a major reason for Green Party criticism of the eco-town proposal. However, the party still has many concerns until a more sustainable overall development plan for Norwich has been agreed. 'The decision to go ahead with the eco-town must now be followed by fresh thinking and consultation on the detail, scale and nature of the project. A proper eco-community should contain local jobs and local services as well as excellent public transport links and zero carbon homes. 'I welcome the government rejection of the claim that the eco-town needs the NDR. Yet another spurious argument for that road has dissolved and the NDR plan should be scrapped. The NDR proposals have been distorting and skewing the local strategies for transport and housing and we need to look at these afresh. Plans for massive housing expansion, pushed by the Conservative led county council, via the GNDP (Greater Norwich Development Partnership), are not justifiable. 'The government and local councils should now produce a new development plan for Norwich with excellent transport and other sustainable features - and consult with the people of Norwich, particularly North East Norwich, as they have not been adequately consulted so far. 1000 Thursday July 16th: The Forum, Norwich: Peter will meet members of the LGBT community preparing for Norwich Pride, the city's first ever weekend of gay themed talks, music and film events, which begins on July 25th just after the election. It aims to make Norwich a city where everyone feels safe, without bullying. Community film-maker Michelle Savage will be filming Peter as part of the event, and will show him work in progress on a presentation to be shown on the Forum's giant screen. 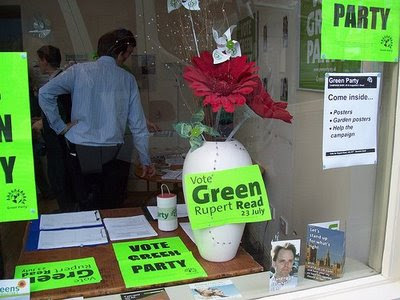 1230 Thursday July 16th: Green Campaign Shop, 68 St Augustine's Street, Norwich: Peter will launch the latest Green Party posters for the final phase of the campaign. Later he will join Rupert Read canvassing among shoppers in Magdalen Street. *Make them listen - about accountability and Green proposals for reform of Parliament. “I hope voters in Norwich North will seize the opportunity that this By-election provides them with: to draw a line in the sand between today’s tawdry, life-destroying politics, and the positive transformation that green politics now promises. In Rupert Read, the Green Party has a candidate who could achieve that breakthrough in Norwich North”. 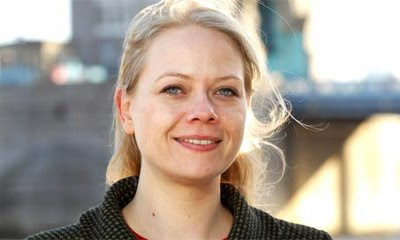 Sian Berry, the former Green Party London mayoral candidate, will join Rupert to campaign in Norwich North on July 21st. "I am really looking forward to taking to the streets of Norwich again in support of Rupert Read in the Norwich North by-election next week. I have always known Rupert to be a tireless campaigner and someone with a unique perspective on bringing fair play back into politics. As a councillor in Norwich, he has worked hard on local issues, from housing to fair pay, and has made a real difference to people's lives. And, as a philosopher, he is just as comfortable tackling the big issues, from the best way to deal with climate change to the need for peaceful ways to resolve conflicts. 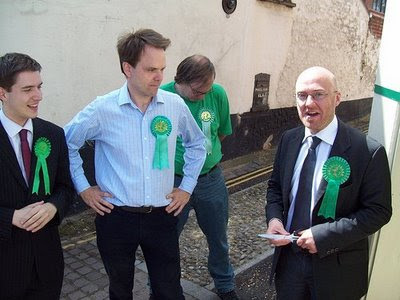 Rupert has already represented the people of Norwich at City Hall for 5 years, and I urge the people of Norwich North to vote for him as a hardworking and principled representative for them in Westminster on 23 July." The Norman Centre, Bignold Road, Norwich. Below are advance excerpts from his Wednesday night speech in Norwich. “Labour has lost its heart and soul. It took us into an illegal war in Iraq. It has eroded hard won civil liberties, commercialised public services like education and heath, and is backing new nuclear and coal-fired power stations, to the detriment of the environment. “The Greens have replaced Labour as the most progressive party in British politics. We Greens are the only party that wholeheartedly defends public services and working people. “I urge disillusioned Labour voters to come over to the Greens. Don’t give your vote to a government that takes you for granted and has betrayed Labour values. Support a party that stands for a fairer, more just and free society – the Green Party. 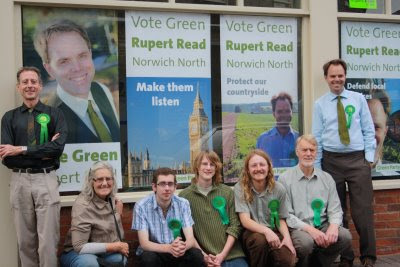 “I know Rupert Read, the Green Party candidate for Norwich North. He is a personal friend, and an intelligent, passionate defender of liberty, justice, peace and the environment. “He’s got vision. He knows a better world is possible and, as your MP, he would work with real commitment to achieve it. “Rupert is a man of the people. That’s what we need at Westminster. We don’t want more machine politicians churned out by the head offices of the Labour, Conservative and Liberal Democrat parties. “Why send another Labour, Tory or Lib Dem clone to Westminster? Give the Greens a chance. Parliament needs some Green MPs, not just more MPs from the old, grey, establishment parties. There are enough of them already. MPs from the big three parties are yesterday’s men. “Gordon Brown has slashed interest rates to savers and allowed people's pensions to be eroded. He is closing post offices. “Labour plans to waste over £120 billion of public money on Trident nuclear missiles, two new super aircraft carriers, ID cards, new motorway building, the war in Afghanistan and the botched computerisation of the NHS. “The Greens would cancel this waste. We’d spend the £120 billion on new council housing, better pensions, improved public services, renewable energy and cheaper, safer and cleaner public transport. “Parliament needs a grassroots, anti-politician like Rupert, not another party establishment career politician. That's why I am supporting his campaign to be elected as the Green MP for Norwich North. “Fed up with the established parties and corrupt MPs? It is time for change. Register your anger by voting Green - for a new, clean politics. “There are already plenty of Tory, Labour and Liberal Democrat MPs. Electing another MP from these big-three established parties won't make any difference. 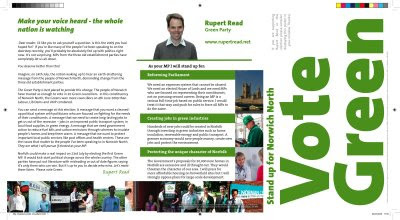 “But electing Rupert Read as a Green MP for Norwich North will make history. He would be Britain’s first ever Green MP. 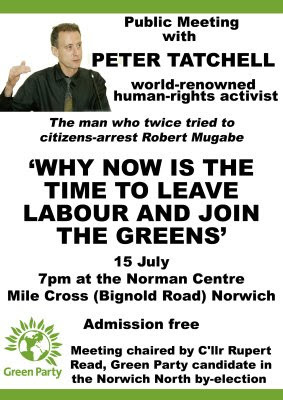 It would put Norwich on the map big-time,” said Mr Tatchell. Turn Norwich North from red to Green on July 23rd! Letter For Hope - The Guardian, 14th July 2009. Green Party city councillors in Norwich want the council and all political parties to express unambiguous opposition to any possibility of the development of a local waste incinerator. Norwich City councillors will tonight (Tuesday 14) be considering a Labour motion which expresses concern about waste management in Norfolk, in the light of the County Council's decision to abandon plans for an 'anaerobic digestion plant' at Costessey, to process waste. The motion seeks to press the County Council to explore alternative waste disposal ideas, but Green Party councillors are concerned that it does not rule out incineration - a method they consider contrary to good waste management and potentially harmful to public health. Green Party councillor Rupert Read will try to amend the motion so that the county council will be asked to categorically rule out incineration from its waste management options.
' After the County Council's abandonment of the Costessey waste treatment project I am concerned that the new Tory led council may be drifting towards undesirable waste management plans. 'It is vital that those plans are absolutely clear and rule out any option for an incinerator and I shall be trying to amend the city council motion to make this demand clear. 'Incineration is a poor way of dealing with waste: it does not encourage waste minimisation or recycling and it has a long association with health problems for local communities. 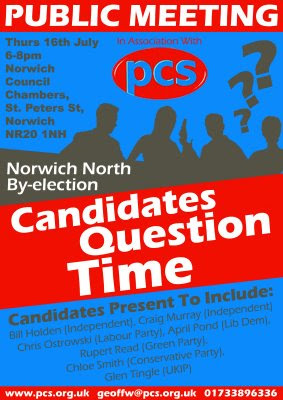 Please try to attend these important hustings - Anglia TV will be present so a good showing from the Greens would be very helpful! Mark Thomas Video - Why You Should Vote Green! It's sad to see the LibDems continuing to practice dirty politics as, out of their extreme fear of finishing behind us, they scattergun more and more vitriol against us/me. What the citizens of Norwich North are saying to me is that they want the candidates to run a positive campaign and focus on the issues. I've been talking a lot today about resisting excessive development around the edges of the Norwich area, and preserving the character of the countryside. April Pond seems by contrast to be basing a significant part of the LibDem campaign on smearing the Greens. If the LibDems had confidence in their policies, surely they would choose to run on those? Of course Ms. Pond is presumably being told from above how to run the campaign, and so I recognise that she is under pressure to continue to go negative. But she sets the tone and that is why she should sign the Clean Campaign Pledge. GREEN PARLIAMENTARIAN IN NORWICH NORTH! 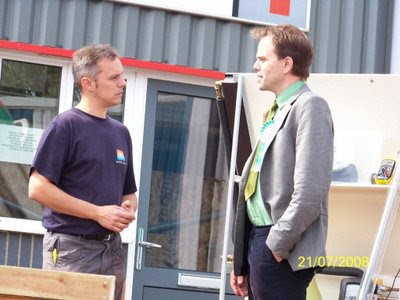 The Green Party candidate in the Norwich North by-election, Rupert Read, is aiming to become the first ever Green MP at Westminster in the election on July 23rd. But in fact the Greens already have two MPs – in the Scottish Parliament at Holyrood. One of them is Patrick Harvie MSP, who has been a Green MSP for Glasgow since 2003. Mr Harvie will be in Norwich on Sunday and Monday (July 12th and 13th) in support of Dr Read’s campaign in Norwich North. Patrick Harvie says although the Greens may be few in number, they regularly hold the balance of power at Holyrood and have notched up some remarkable achievements, including the first Green Act in Britain – Patrick’s own legislation to tackle hate crime. Patrick Harvie is clear that even a small number of Green MPs at Westminster could begin working towards similar progressive measures. That’s why he’ll be out campaigning with Rupert Read in various locations across Norwich North on Sunday and Monday, and ready to meet the media on request. Click to see the Norwich North Clean Campaign Pledge and find out who has and who hasn't joined me in signing it! The invitation to sign a pledge to run a clean campaign in the by-election, proposed by Rupert Read, the Green Party candidate in Norwich North, has set the other parties thinking. Conservative candidate Chloe Smith has decided that she'll sign. Lib-Dem candidate April Pond has decided that she won't. Labour candidate Chris Ostrowski says the pledge (full text below) doesn't go far enough and proposes an extra pledge of his own. Mr Ostrowski says candidates should pledge that if they are elected, their work as an MP should be their only job. The Green candidate, Rupert Read, is happy to accept that suggestion and is prepared to sign that pledge. Dr Read says: "We are starting to hear about the many MPs who earn thousands through second jobs and directorships, who instead of listening to their constituents are listening to big banks and corporations. If I am elected, my only job will be to serve and represent the people of Norwich North at Westminster. "It sounds as if the Labour candidate in Norwich North wants to make that pledge, which is good. But what about all the Labour MPs who have second jobs already?" Dr Read's message now to Mr Ostrowksi is this: "I'm prepared to sign your pledge; what's stopping you from signing ours?" The invitation was extended by Dr Rupert Read, who believes there is no need to resort to the kind of personal attacks which some parties try to level against rival candidates. There has been a positive response from Chloe Smith, the Conservative candidate. Rupert Read said: "It is because we disagree hugely with the Tories, and other parties, about real issues, and because we want this election to be about those issues, that we are putting forward this statement. A clean campaign is not one without disagreements; on the contrary, it is a campaign in which the real and major disagreements between the candidates are not obscured by lies, personal attacks and mud-throwing." The same pledge was signed by all candidates on the Green Party list in the eastern region at the European elections last month. At that time it drew the public approval of "the man in the white suit", veteran anti-sleaze campaigner and former Independent MP, Martin Bell. The pledge (full text below) promises that signatories will tell only the truth about the achievements of their party, make only reasonable promises and stick to campaigning on issues that concern the people of Norwich North without resorting to personal attacks. It encourages voters to police the pledge themselves and to keep signatories to their word by reporting to the media any apparent breaches. After the scandal surrounding the MPs expenses expose Dr Read says the object is to demonstrate that politics can be a clean and positive activity engaged in for the good of all. He aims to play a full part in cleaning up the image of Parliament should he be elected the Greens' first MP on July 23rd. To fight a clean, positive and honest campaign around the issues that concern the people of Norwich North. In particular, to be honest about public spending, and not to scaremonger in ways that may frighten the most vulnerable members of our society, such as children and elderly people. To sign up to the transparency pledge on MPs' expenses below. And to help us enforce this Pledge, by reporting truthfully to us and to the media any apparent breaches of it. We hope by this pledge to serve as a positive example for Norwich and for other election campaigns in the future. 1. To publish online details of all of personal expenses incurred as a Member of Parliament. 2. To publish online details of all of office expenses incurred as a Member of Parliament. 3. To publish online details of all donations of more than £1,000, in line with Electoral Commission rules. 4. To appoint a local firm of auditors to approve expenses accounts at the end of every financial year. 5. To open up the unedited expenses claims to local newspapers at the end of every financial year. 6. To never claim for food. 7. To never claim for furniture or household goods. 8. To meet all tax liabilities  such as stamp duty  without claiming them from the taxpayer. 1. 2. 3. Rupert's Read: July 2009 4. 12. 15. 18. 19.